I do not want to understate this: The Iowa Democratic Party's Virtual Caucus plan for next February's first in the nation caucus is, in the big picture, good. People who can't attend in person can participate, New Hampshire is mollified for the moment, and it meets the DNC's requirement to release a raw vote count. But this is a draft plan, and drafts invite critiques. There's still one piece to the plan that needs work: the way that votes from the Virtual Caucus get counted toward the state and national delegate counts. As I said in part one, my personal preference is for a primary. But I accept the political impossibility of that - not that Iowa Democrats should not be considering that, but that Iowa Republicans are running the state and see no reason to change. Given that, my second choice would have been to send those absentee votes - "virtual attendees" as we are now calling them - out to the precincts. The caucus chair opens up a smart phone app and sees "Simon 22, Jackson 18, Gephardt 6, Babbitt 1, Dukakis 19, Gore 0, Kevin Phillips Bong naught." They get counted as if they were in the room, and there's some kind of system to re-allocate the ones that are non-viable. I like that - but I have worked in an election office for 21 years and I spend my free time setting up caucuses and playing with complicated election math and lists and writing stuff like this. I am not normal (my mother had me tested). And in yesterday's conference call, IDP chair Troy Price indicated that local activists weren't keen on that kind of complication (and by implication were more than happy to let the state party deal with it). So the state party will. And they will do it by taking the Virtual Caucus votes and pooling them at the congressional district level. As Price described it, it will be like adding a county to each congressional district, Virtual Caucus County so to speak. Within each CD's Virtual Caucus County, non-viable votes will be re-allocated by second/third/fourth/fifth choice until they're in a group with 15% viability. For me that's not as good as doing it at the precinct or even county level, but it's still pretty good. Here's the catch, and here's the single biggest flaw to the whole plan. If 10% of Iowa Democratic caucus participants choose to participate in the Virtual Caucus rather than going to the traditional in-person caucus, they count for 10% of the delegate allocation. And that's good. But if 50% of people choose the Virtual Caucus, they still only count for 10%. In addition to the question of fairness, this raises a couple other issues: campaign strategy and overcrowding. By capping the delegates you can get from the virtual caucuses at 10% of the total, it's not clear what is the most beneficial approach for a campaign. Someone's vote could count more by going in person to their local caucus... or maybe not! Basically, with this setup, if I were running a campaign, I wouldn't try to just go around trying to sign up my supporters who could go in-person to their caucus for this virtual system. I'd probably only limit it to people who legitimately can't turn out on caucus night. With the new rule of locking down attendees once they are in a viable group, IDP is rightly moving away from strategic game playing toward a more open and fair system. But weighing votes differently depending on how they are cast introduces new ways to play games, some of which we can't even envision yet. But for me the bigger problem, indeed the biggest problem of all with the caucus, is overcrowding. City High caucus, Iowa City, January 3, 2008: Attendance 719. That climbed to 935 in 2016. The caucuses as they existed in 2016 were NOT a "neighborhood meeting" for "organizing the party." They were a frustrating endurance exercise of being crammed into a too-small room, and trying to understand confusing and arcane rules. 430 people attended my caucus, but only 30 stayed once alignment was final, and only 15 stayed for the platform and party business once the delegates were chosen. And this is most people's only interaction with the local party structure. How many times have you heard a variation of this: "The caucus was so disorganized, the Democrats don't have their act together, I'm never going to any of their things again." Some of the rule changes, especially the ones locking down people once they are in viable groups and letting them go home if they want, will help. 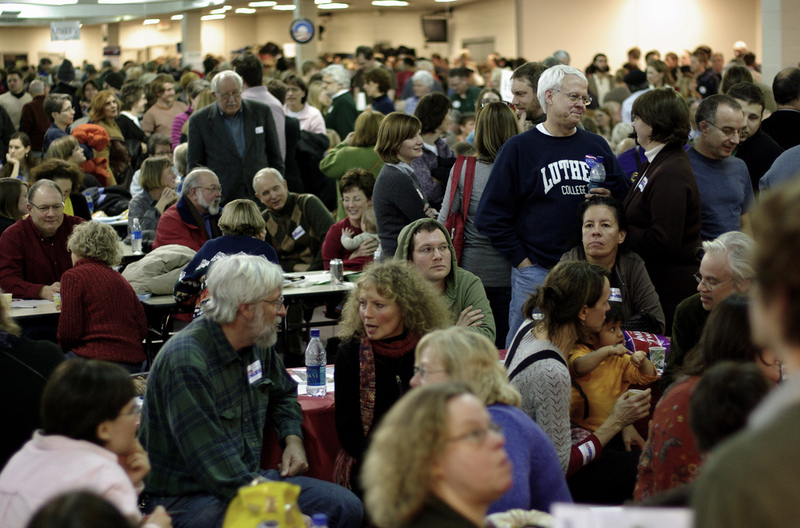 But as far back as 2004 the caucuses had outgrown "neighborhood meeting." There simply are not enough rooms in enough neighborhoods that are big enough to hold the number of people who want to attend. There are not enough parking spaces to hold all the cars when you require all the "voters" to be at the "polls" at the same time rather than letting them come and go all day. More and more venues are saying no, legally or not, because they don't want the crowds in their facilities. The Virtual Caucus needs to be the centerpiece of addressing the overcrowding problem. We need 50 to 80% of people voting early, to get physical attendance back down to the 2000 and 2004 levels, or else we won't be able to fit into the space available. Yet how can I in good faith encourage 50 to 80% of my county's caucus goers to sign up for the Virtual Caucus, when their votes will only count for 10% of the delegate allocation? I can tell people who could not otherwise attend to sign up, and that's good (my own wife missed Caucus Night 2016 because she had mandatory overtime). But I would have to tell anyone who was wavering, or only looking to vote Virtual for convenience rather than necessity: "Your vote will count more if you go in person." Maybe not, because in theory only 1 or 2 or 5% of people could choose the virtual caucus. But in practice it seems that 10% is a severe underestimate of the interest in a system where you do not have to fight that crowd and can sit at home and vote on your phone. So that's the problem. Here's a couple solutions. Laura "Bleeding Heartland" Belin, who is also mostly positive about the plan, would like to see the Virtual Caucus counted based on turnout. If 20,000 Democrats caucus virtually and 180,000 caucus in person, then 10 percent is the right share of delegates to assign based on the virtual results. But if 50,000 people sign up to caucus virtually and 200,000 show up at precinct caucuses on February 3, then the virtual caucuses should determine 20 percent of the total state delegates. If 100,000 people call in and 150,000 attend precinct caucuses, then 40 percent of the state delegates should be assigned based on the virtual results. That seems fair and reasonable. I'd like to take it a step further, make the whole caucus process more fair, and maybe promote my own county's self-interest. Since the party is going to calculate and release a raw vote count for both the first alignment AND the realignment, why not simply base the national delegate count on that? Put all the votes from each congressional district, virtual and in person, into one pool. Reallocate non-viable votes as needed - either through ranked choices for the virtual voters or realignment for the people who attend. Then allocate the national delegates based on that CD level vote. This keeps the Hard Math at the state level and not the local level, and eliminates the need to pre-determine or estimate what share of the vote should be allocated to the virtual caucus. To repeat the House District 55 mantra: just count all the votes. There would be some minor variation between the four congressional districts, but within each CD it would be one person, one vote. Caucus delegate counts, at both the precinct and county level, are not based on one person one vote. They are in effect based on a hypothetical general election universe, with precincts and counties allocated delegates based on their performance for governor and president in the last two general elections. That rewards precincts and counties that vote Democratic in general elections but do not show up for the caucuses, and punishes counties that both do well in general elections AND turn out heavily on caucus night. Johnson County gets a lot of shade for being "the People's Republic," but we also produce the best Democratic margins in the state and provide a lot of cash to candidates in other districts. But on caucus night, the rules sell us short and we are punished for our own success. Our votes count less than small counties. Because delegates are allocated by general election vote, we only counted for 6% of the 2016 delegates. Yet we were 11.5% of the statewide caucus turnout. Put another way, a vote in Random Average County was twice as valuable as one in Johnson - and this has been the case for cycle after cycle. One person one vote would give Johnson County what we consider our fair share. I understand that the small counties won't like my one person one vote idea - but nothing is stopping any other county from showing up at the same percentage rate that Johnson County does! If rural travel is harder, well, now we have the virtual option so that's not an excuse anymore. So those are two ways to more fairly allocate the Virtual Caucus votes. However, there's one major catch to my one person one vote plan: the Iowa Democratic Party's constitution requires that state convention delegates be allocated by county based on general election results. That can and should be changed to one person one vote - but that can't happen till the next state convention in June 2020. Since that's the case, I'm with Belin: give the virtual caucus a share of the delegates based on their participation rate. But IF we are going to be married to the idea of Virtual Caucus County equals a pre-determined X% of the allocation, then X needs to be a lot bigger than 10. One of Price's arguments for the 10% number is that there is no track record available to estimate how many people will choose an absentee process - which is true - and it's "a good starting point." Just over half of Iowa Hillary Clinton voters, and just under half of Fred Hubbell's voters, chose an early ballot. So, if you're going to have a pre-set percentage, I'd be a lot more comfortable with the Virtual Caucus share of the delegates at 50% rather than 10 - especially since we need to get roughly 50% of the crowd out of the caucus rooms in order to fit. I would also be a lot more comfortable encouraging people who are concerned about "how much" their vote will count to choose virtual caucusing rather than in person if the Virtual Caucus was weighted at 50% rather than 10. Sure, it's a guessing game - but it's a better guess with some math behind it. And if the guess is too high, well, then the people who were historically under-represented because they couldn't attend in person will be over-represented for one cycle. Monday's roll out of the delegate selection plan was the start of a 30 day public comment period. So I've made my public comment, and I'd encourage other Iowa Democrats to think about these things and share your thoughts with Troy Price or your friendly neighborhood state central committee member. As for me, I'm more than ready to do the work of making the 2020 caucuses happen, and it will be an all hands on deck task. Help your candidate, sure, but help with the prep work and the signing in and the explaining too.